How To Make The Best Super Easy Maple Pecans! 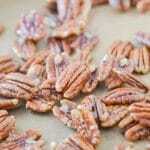 Home » Snack » How To Make The Best Super Easy Maple Pecans! Maple Pecans are so simple! 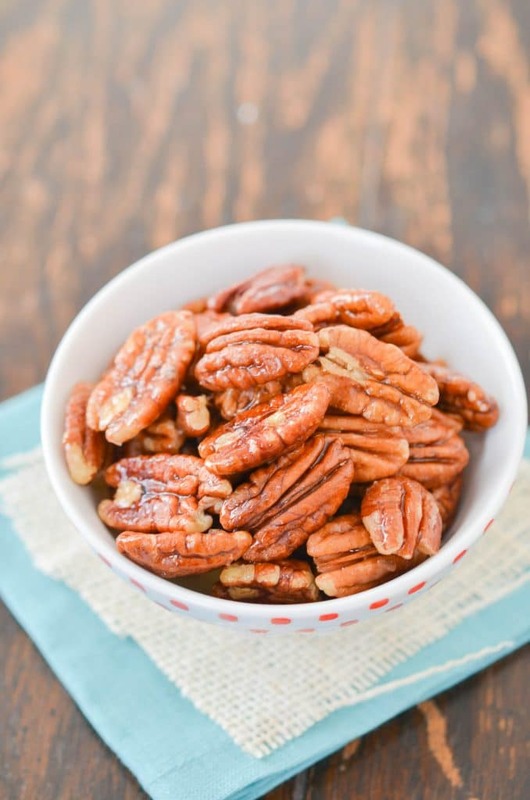 These pecans are a delicious healthy treat that is quick and easy to make. 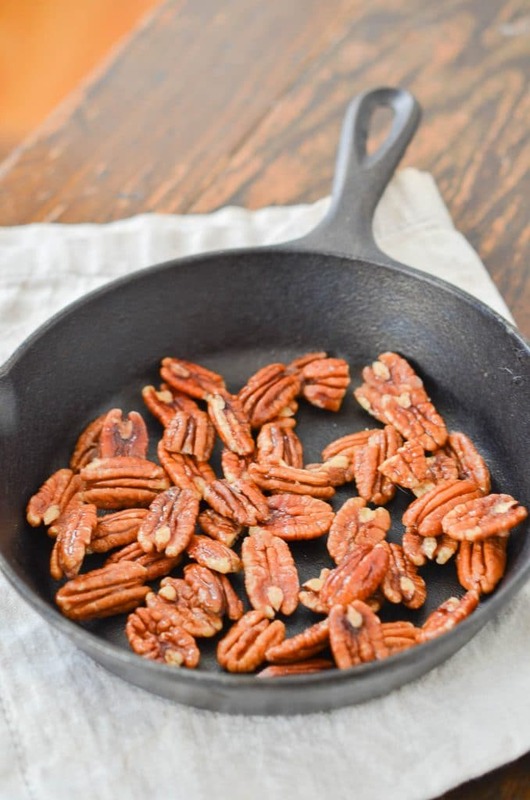 Skillet-Roasted with just three ingredients – pecans, maple syrup and coconut oil! Enjoy them warm right out the skillet, tossed on your favorite salad, as a topping for ice cream, tossed in grain-free cranberry nut granola or in this sweet potato casserole! There are many options for using these simple candied pecans. Kids love these as a snack! College football games used to be a place I looked forward to chomping on candied nuts. The delicious aroma of sweet roasted nuts filled the air and was so hard to resist. But, it’s the ingredients that stop me in my tracks. Pecans have impressive health benefits: “the healthy fats of pecan nutrition are powerful in the production of antioxidants, reduction of inflammation”. Plus helps maintain high energy and lose weight. All good things. So I sought a better recipe that would be grain, gluten and dairy free. And easy! Fast forward several years and I’m delighted for the opportunity to control the ingredients by making my own Paleo Maple Pecans. Honey Roasted Cashews are also high in demand in my house and brought along to events as well. Here’s something fun I like to do with these maple pecans – chop them up a bit and then add your favorite non-dairy vanilla ice cream. Yum! Heat up a cast iron skillet to medium-low. Spray (or use about 1 TBSP) the skillet and coat with your oil of choice. Toss in the pecans, maple syrup, and salt (to taste). Stir for several minutes (2-4) to coat all the nuts. Optional add-ins: 1/2 tsp. ground cinnamon an 1/4 tsp. vanilla extract (add after turn off the stove). Spread the nuts on a baking sheet lined with parchment paper or a silpat. Let cool on baking pan for one hour. Paleo, vegan, grain free, gluten free and dairy free! Paleo Maple Pecans cooling on a parchment-lined baking sheet. All that cheering at sporting events takes energy, right? Skillet-roasted maple pecans are the perfect snack for this! How to Make Super Easy Maple Pecans! How to make super easy and delicious Maple pecans! 3 ingredients if you include salt and takes only minutes! Makes delightful holiday gifts! Make your own and control the ingredients! Preheat your cast iron skillet over medium-low heat. Add the maple syrup, pecans and salt to the pan. Using a spoon, stir to coat the pecans with the maple syrup. 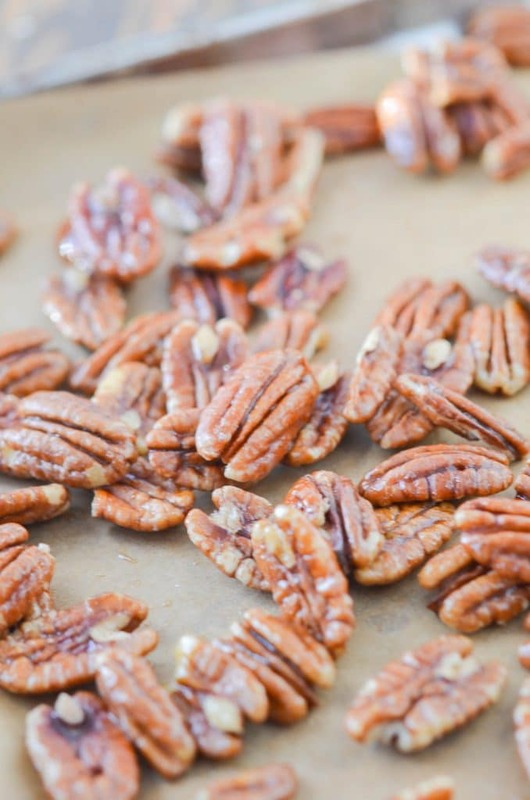 Turn off heat, and place pecans on a baking sheet or plate with parchment paper (or wax paper). Let cool. Store in airtight container. Should last several weeks. *I often spray my cast iron skillet with coconut oil spray and that is enough to coat the pan evenly and well. Previous Post: « How To Make A Mango Smoothie!